Annapurna region trekking in Nepal is considered one of the best treks in the world, though road construction is threatening its reputation and its future as a classic trek. Yet no one disputes that the scenery is outstanding. 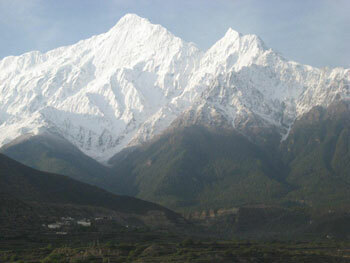 The Jomsom trek is commonly known as a part of the Annapurna Circuit Trek. It begins from Pokhara and passes through the Valley of Kali Gandaki River to the pilgrim site of Muktinath. Jomsom trek takes you through distinct regional scenery of rivers, flora, fauna and above all - the Annapurna & Dhaulagiri mountain ranges. The natural beauty along the Jomsom – Muktinath trek is breathtaking. The scenery of the trail ranges from the rhododendron forests to rocky cliffs and desert of Mustang. The area is also known as shadow with rainfall. Eagle Treks and Expedition and its guide make Jomsom trek easier and memorable for your life time. The trail follows the Kali Gandaki River. This river forms the deepest gorge in the world and on one side lies the Annapurna mountain range and on the other side the Dhaulagiri. The Kali Gandaki has a wide river bed during the winters the river is practically dry but during the summers and monsoons the water level rises with rain water and melting snow. Where we can find the fossil rocks (Shaaligram) on the bank of Kali Gandaki River. The Shaaligram is believed to be sacred on the Hinduism. The culture among the trail is enrich with religious mixture of Hinduism and Tibetan Buddhism. Jomsom is Mustang district headquarter. So, all the administration offices of Mustang district are here and people from every part of this district need to come to get all the paper work. So, Jomsom will be quite busy must of the time. It is getting busier since the road has been built here. Many pilgrimage would got to Muktinath and Kagbeni through this town. You can fly in and out to/from Pokhara too. Early morning in between 7 to 9 AM, we will fly to Jomsom from Pokhara and which is only 20-25 minutes flight. After landing at Jomsom we will have some time to acclimatize and breakfast. We starts our hike to Kagbeni after breakfast. This will take about 3 hours to reach Kagbeni through the bank of Kaligandaki river. We will reach Kagbeni by lunch time. And it will be your first night in the mountain. Kagbeni is the gateway to Upper Mustang. We will be trekking in only lower part of Mustang. Overnight at the guest house with full board. After breakfast we will start our hike to Muktinath. This day we need to ascends to Muktinath and which will take about 4 hours to reach most popular pilgrimage site among the Hindu and Buddhist. We will reach Muktinath by lunch time. After lunch we will explore the different temples, Monasteries, Gumpas and nature beauty with unique culture. This is also called a pilgrimage trek in Nepal. Overnight at guest house with full board. Have early breakfast with a beautiful views of the different mountains and valley around Muktinath. We will be ascending trek from 3760 m to 2710 m while walking downhill your muscle may feel painful and we are taking easy down to Jomsom via Eklebhatti. This is about 5 hours of walking in average pace. Overnight at lodge with full board. We will start our trek after breakfast. You can see morning flights are coming from Pokhara and it will be nice to watch plane landing and takeoff. Trekking through Kaligandaki river and also called as windy valley will be very interesting. You will pass Syang village and Marpha village to reach Tukuche. Both villages are very nice and old, Marpha is much bigger than Syang. They grow very nice apples and Marpha called as a Apple kingdom. Tukuche is also nice settlement of more than 100 houses of Thakali people. You can visit Monasteries, Apple distillery and village with your guide. Overnight at lodge with full board. Our trail follows the bank of Kaligandaki river even today almost down to Ghasa. You will pass Larjung, Kokhe thanti, Kalopani and Lete to reach Ghasa. You will be stoped one of these village for the lunch. You can see the best view of Mt. Dhaulagiri (8167m) and Annapurna I (8091m) from Kalopani. And, it may takes approx 6 hrs of walking to Ghasa. Overnight at lodge with full board. We start our trek in the morning as a usual. It will be very interesting walk today because you can see one of the beautiful waterfall in Nepal, deepest valley in the world and natural hot spring. You will pass Pairothaplo, Tal bagar, Kopche pani, Rupche Chhahara and Dana to reach Tatopani. "Tato" stands of Hot and "Pani" stands of Water so the meaning of this place is hot-water. Where you can enjoy the natural and very famous hot spring. This is the place to be fresh up with natural hot water, the day is about 5 hours long walking and we will enjoy the river bank trail. Overnight at lodge in full board. Today we will meet our goal after a long uphill from 1190 m to catch up with 2855 m and also the first day of long uphill as well. It will be approx 7-8 hrs to reach the Ghorepani. You will pass Gharkhola, Ghara, Shikha, Phalate and Chitre to reach Ghorepani. Since you arrive at Ghorepani you will enjoy with the beautiful view of Annapurna and Dhaulagiri mountain ranges. Overnight at lodge in full board. This morning we start our trek early in the morning to enjoy the sunrise view. Annapurna, Dhulagiri and other mountains ranges from the top of Poonhill 3210m in the morning will be just amazing. After enjoying the all major peaks with stunning sunrise from Poonhill we will be back to lodge for breakfast and we will continue our trek to Tadapani, through the rhododendron forest enjoying exotic wildlife and birds. YOu will pass Deurali and Banthanti to reach Tadapani. Overnight at lodge in full board. You can get up early in the morning if you are not too tired because you can see beautiful sunrise view from here. Today will be the second last day to get to city life. You will pass Bhaisi kharka and Sitkyu to reach Ghandruk. It takes about 3 hours to get Ghandruk from Tadapani, we will reach here by lunch time and after lunch we will visit Gurung Museums, Monastery and beautiful village. This is one of the richest village on sanitation with full knowledge of awareness and also know as Eco Trekking area. Overnight at lodge in full board. Today we will walk to Nayapul crossing different villages like Kyule, Syauli bazar and Birethanti. It will beapprox 4 hours of walking. We will have our final lunch in mountain at Birethanti and we will continue walking to Nayapul. It takes 40 minutes to Nayapul and drive to Pokhara. Overnight at Hotel on B/B. Day 16: Final departure to Kathmandu airport or further program according to flight schedule.